Oscar Wilde once wrote that, 'Music is the art which is most nigh to tears and memories,' and so it goes in the heartrending animation Coco, which sees a young boy unlock the secrets of his ancestry through his clandestine love for song. 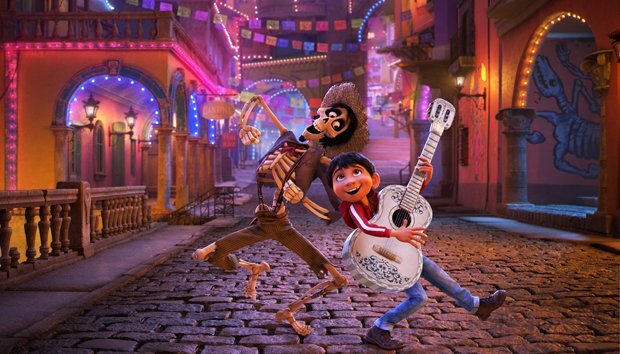 Set in a Mexican village and shifting between the world of the living and the Land of the Dead, Pixar present an eye-popping mosaic of a musical. The animation studio have had a mixed run since 2015's superlative Inside Out, with The Good Dinosaur and Cars 3 proving underwhelming and Finding Dory reprising its predecessor Nemo, albeit with charming results. With Coco they're taking more of a risk; it's so deeply embedded in Mexican folklore and traditions as to feel niche, while the preponderance of skeletons mean it's rarely cutesy. However, at its core is the plight of Miguel Rivera, an adorable 12-year-old (voiced by Anthony Gonzalez), so doughy of face and tangible that you could reach out and pinch his chubby cheeks. He's an enthusiastic guitarist and singer but, unfortunately for Miguel, when his great-great-grandfather ran out on his family to tour the world as a musician a hatred of music was born that has spanned generations of Riveras. Thus the youngster hides his passion, and his talent, from this disapproving family of shoemakers. After stealing a guitar from the mausoleum of the popular crooner whom he believes to be his great-great-grandfather, Miguel passes into the spirit world. In an attempt to rectify the situation, he is taken by deceased family members to the Land of the Dead, where he must track down the aforementioned singer, Ernesto de la Cruz (Benjamin Bratt) – who remains just as popular in the afterlife. He's assisted by Héctor (Gael García Bernal), already a skeleton, he's nevertheless on his last legs. Helmed by Lee Unkrich (Toy Story 3) and co-director Adrian Molina, there's a pleasing familiarity to its fusion of humour and borderline schmaltz. Even better, like Disney's Moana, Coco benefits from a cultural idiosyncrasy which informs and enhances its narrative. Amongst those features worked strikingly into the plot are the significance of ofrendas (shrines to the dead), Aztec marigolds and alejbrije (fantastical creatures which here act as bedazzling spirit guides), while the film has a hoot playing up the eccentricity and self-obsession of iconic Mexican artist Frida Kahlo. These details lend considerable richness to an ultimately predictable story built on those perennial animation favourites: a quest to find one's true self and a focus on family. The tunes are pleasant enough, if a little ordinary; the ironically titled 'Remember Me' has several outings without making an unshakeable impression. Yet Coco's sincerity is undeniable and its creativity often remarkable. The songs might be unlikely earworms but the film easily earns its place in your heart. General release from Fri 19 Jan.